Cherry Creek High School in Greenwood Village, CO, is the largest public high school in the state, serving nearly 3,600 students. Like most teens, our students experience a great deal of stress in their lives. 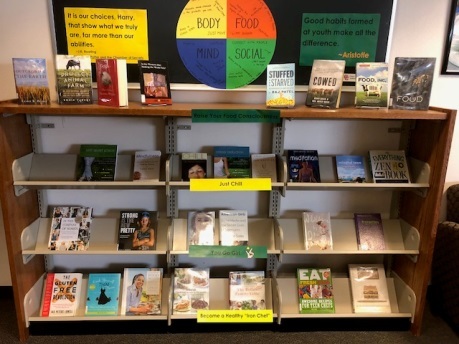 Therefore, we kicked off the new year with library programs to help address healthy lifestyle choices and build more connections with our students. Our January E1ev8 Your Health & Wellness initiative included a full month of wellness-related activities and events. We’re already planning for our next one in January 2019. Here’s how it worked for us—and suggestions for launching your own. Displays related to health and fitness at Cherry Creek High School. Planning our wellness month, we wanted to address four areas of teen health and wellness: exercise, nutrition, relationships, and mental health. We had students vote on potential program topics and then reached out to local organizations and experts to build a schedule of events. We scheduled events tailored to specific classes and mapped out the month to include a few events each week. We promoted the month-long program through school newsletters, student announcements, email blasts, posters, social media, and computer screensavers in the library and around campus. In addition, we also highlighted and updated our print resources on current issues of mindfulness and healthy living. We tapped into free and affordable resources as much as possible while building the program. Teachers led yoga and gratitude journaling sessions. We negotiated speaking fees and partnered with our activities department to cover costs. When possible, we borrowed resources and tapped into free speakers. We drew from a parent and community donations account, "Friends of the Library," to pay for some of the events and prizes. Cycling while reading at the library. We had hundreds of students and many teachers attending sessions, some led by local experts. English teacher Marissa Voss appreciated a session on gratitude journaling because, she wrote, "Students are increasingly bombarded with devastating current events, negative news cycles, and critical social media exchanges. They are stressed and anxious. Teaching students skills to manage that stress is important! Overall, it brought in fresh energy for the new year." Our library had installed an exercise bike with funds from our district foundation in 2015. We encourage students to use the bike to reduce stress. This year, we took it up a notch. Borrowing the idea of a Pedal-a-Thon from our colleagues at Eaglecrest High School Library in Centennial, CO, we held a cycling competition. 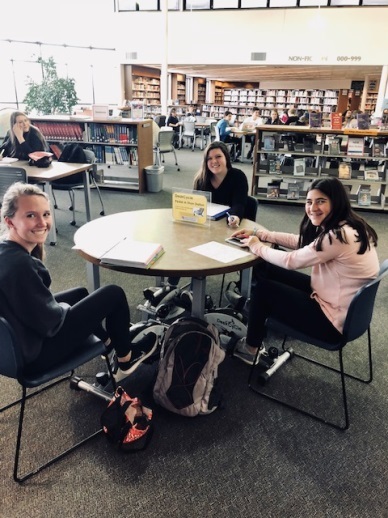 Students were invited to use our exercise bike and DeskCycles during off periods while reading or studying in the library. Staff checked in participants and logged their daily mileage. The 79 participants rode nearly 1,200 miles in January. We rewarded the top three finishers with gift certificates to a sporting goods store. The competition stayed good-natured and friendly "until the end of the month, when students got an idea of what it would take to win. It got a little more competitive," said teacher librarian Ryan Whitenack. 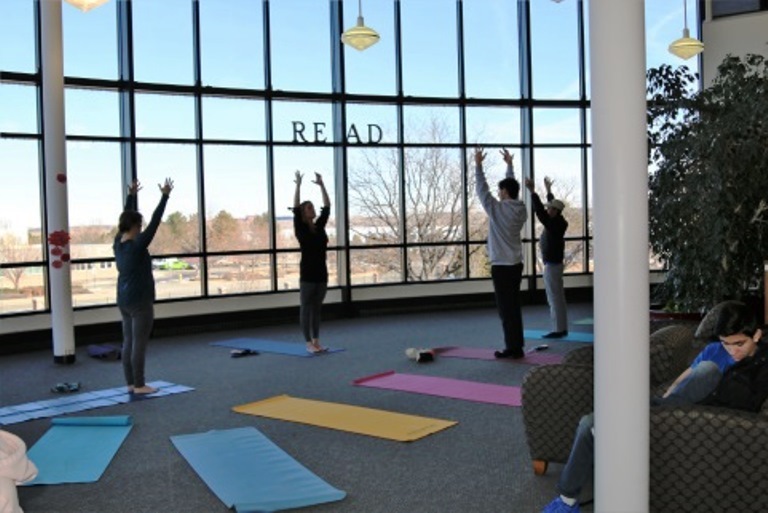 One of our school counselors, also a certified yoga instructor, led lunchtime yoga in our reading areas, with views of the Cherry Creek State Park. We offered three mindfulness sessions that included practical techniques and straightforward meditations, led by mindfulness educator Kristin McKeown of the self-care organization Teaching Balance. Student feedback was positive. "I am going to try my best to end my habit of negative self-talk,” one wrote. "I am interested in practicing mindfulness throughout my day to regulate stress," another noted. The theme of noticing one's thoughts without identifying with them “is at the heart of how I teach my unit on Buddhism," world religions teacher Noah Zepelin commented. Annette Sloane, a food and eating coach, presented to several of our health, PE, and foods & nutrition classes on the issues of body image and personal relationships with food. One topic that resonated deeply with students was how media can distort self-esteem and body image and how such presentations should be viewed with skepticism. The Growhaus, a Denver non-profit organization that works to educate students on food equity issues, was another favorite session. Students learned how the organization grows produce using hydroponics and aquaponics, as well as about other urban farming practices such as sustainable garden design and beekeeping. The Growhaus mission is to create a community-driven, neighborhood-based food system. We received the Inspire Special Event grant from the American Association of School Librarians, which will help immensely with our 2019 event. We hope to incorporate more student voice and offer a service learning opportunity through The Growhaus. We may initiate a punch card system to enter students into a grand prize drawing. We’ll also partner with a student club and an academic department to coordinate the month and garner more interest. We can’t wait until January! • Use exit slips to gather feedback. These provide instant data about the program for you, teachers, and administration. • Survey teachers about programming that would pique academic or special interests Promote your events via multiple avenues—print, social media, website. Personal invitations to students and teachers are also well-received. Michelyne Gray is the library coordinator at Cherry Creek High School. Annie Campbell is a teacher librarian at the school.